Attach the negative voltmeter lead to the negative battery terminal. Check the voltmeter. If your battery is in good condition, the voltage should be between 12.4 and 12.7 volts. A reading lower than 12.4 volts means that your battery needs to be charged. What is the voltage of a fully charged 12-volt battery? The actual resting voltage, or the voltage a battery will settle at 12-24 hours after being removed from the charger, is closer to 2.1 volts per cell, or about 6.4 volts for a 6v battery, and 12.7 volts for a 12v battery. These numbers assume 100% healthy cells, and may vary a bit lower for older batteries. All below from eMarine Systems at the above link. How do I test a 12-volt battery with a multimeter? Starting Load Test – Adjust voltmeter to DC volts (20-volt range). Watch the voltmeter as you start your motorcycle. If the voltage drops below 9.5 volts, the battery has a very low capacity and should be replaced. As someone in the industry once put it, “few batteries die a natural death, most are murdered”. The following information is designed to tell you how to get the longest life possible from your battery bank and also why batteries fail. When a lead-acid battery is discharged, a soft lead sulfate material forms on the battery plates. During the battery’s recharge, this material is lifted off the plates and recombined into the battery’s electrolyte solution. If, however, the battery is left in a partial state of discharge for as short as 3 days, the lead sulfate material will begin to harden and crystallize, forming a permanent insulating barrier. As this barrier becomes thicker and thicker, the battery’s ability to accept a charge or deliver energy is diminished, resulting in the perception that the battery is no longer usable. The accumulation of such deposits, otherwise known as sulfation, is the most destructive process in the life of any lead-acid battery. 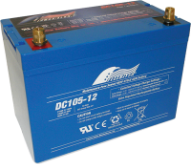 A typical 12-volt lead-acid battery must be taken to approximately 14.2-14.4 VDC before it is fully charged. (For 24 volt systems, double these figures.) If taken to a lesser voltage level, some of the sulfate deposits that form during discharge will remain on the plates. Over time, these deposits will cause a 200 amp-hour battery to act more like a 100 amp-hour battery, and battery life will be considerably shortened. Once fully charged, batteries should be held at a considerably lower voltage to maintain their charge – typically 13.2 to 13.4 volts. Higher voltage levels will “gas” the battery and boil off electrolyte, again shortening battery life. Most battery charger designs and standard alternators installed on boats cannot deal with the conflicting voltage requirements of the initial “bulk charge” and subsequent “float” or maintenance stage. These designs can accommodate only one charge voltage, and therefore must use a compromise setting – typically 13.8 volts. The result is a slow incomplete charge, sulfate deposit build-up, excessive gassing and reduced battery life. Trickle chargers keep the voltage at 13.8 volts which boils and eventually ruins a battery. 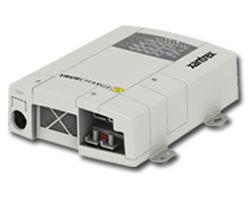 The charger available in most marine inverters, “smart” battery chargers, and alternators with “smart” external regulators automatically cycle batteries through a proper multi-stage sequence (sometimes called 3 stage charging) to assure a rapid and complete charge without excessive gassing. The better charge controllers used in solar charging systems are able to handle battery charging using a pulse width technology. The voltage is held at the desired value during the acceptance phase but the current is turned on only long enough to provide the required charge current. The voltage is reduced in the float stage and current is turned on only long enough to maintain the float voltage. The battery is normally brought up to 75% of fully charged in the Bulk Charge Phase. The Acceptance or Absorption Phase continues charging the battery until fully charged. After the battery is fully charged, just enough charge current is applied to maintain the battery in a fully charged mode (this is the Float Phase). The float phase should not be confused with “trickle chargers” which have over charged (cooked) many batteries. 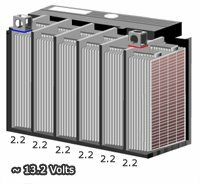 The Bulk Charge Voltage of typical liquid electrolyte batteries should be about 14.4 VDC; AGM batteries about 14.2 VDC; gel cell batteries about 14.1 VDC. There is no one correct voltage for all types of batteries. Incorrect voltages will limit battery performance and useful life. Check your battery manufacturers specification and recommendations. The Float Voltage settings should hold the batteries at a level high enough to maintain a full charge, but not so high as to cause excessive “gassing” which will “boil off” electrolyte. For a 12 volt liquid electrolyte battery at rest, a voltage of 13.2 -13.4 is normally appropriate; gel cells are typically maintained between 12.9 and 13.1. If the batteries are being used while in the float stage, slightly higher settings may be required. Temperature Compensation is important for all battery types, but AGM and gel cell (valve-regulated type batteries) are more sensitive to temperature. Keep in mind that even if you are in an area where temperature does not fluctuate much, where the batteries sits may have significant temperature swings. This can be caused by charging and discharging the batteries, which they themselves will create heat from the inefficiencies of going through the charging cycles. Additionally battery compartment can get hot from justice sun beating down on the boat deck or residual heat from the engine raising the battery compartment temperature.The addition of a low-cost battery temperature sensor to your charge controller or regulator will protect the batteries from being under or overcharged based on this temperature variation ensuring the longer life of your battery bank. A cycle in the battery world occurs when you discharge a battery and then recharge it back to the same level. How deep a battery is discharged is termed “depth of discharge”. A shallow cycle occurs when the top 20% or less of the battery’s power is discharged and then recharged. Some batteries, like automotive starting batteries, are designed for this type of cycling only. The plates of active material are thin with large overall surface area. This design can deliver a lot of power in a very short time. The second type of cycle is a deep cycle, where up to 80% of the battery capacity is discharged and recharged. Batteries designed for deep cycling are built with thicker plates of active material, which have less overall surface area. Because of the lessened availability of surface area for chemical reaction, these batteries yield just as much power relative to their size, but do so over a longer period of time. This type of battery design is preferred in a cruising boat, because discharging a battery to a deeper level is normal while anchoring out due to lights, instruments, fans, and other normal battery usage. Battery state of charge is determined by reading either terminal voltage or the specific gravity of the electrolyte. The density or specific gravity of the sulfuric acid electrolyte of a lead-acid battery varies with the state of charge (see table below). Specific gravity is read with a hydrometer. A hydrometer reading will tell the exact state of charge. A hydrometer cannot be used with sealed, AGM or gel cell batteries. Voltage meters are also used to indicate battery state of charge. Digital voltmeters provide the accuracy to read the voltage in hundreths and are relatively inexpensive and easy to use. The main problem with relying on voltage reading is the high degree of battery voltage variation through out the day. Battery voltage reacts highly to charging and discharging. As a battery is charged the indicated voltage increases and, as discharging occurs, the indicated voltage decreases. With experience, one can accurately determine state of charge using a voltmeter. The battery voltage should be kept at or above a 50% state of charge for maximum battery life. Keep the battery’s electrolyte level to the indicated level and never let the plates be exposed above the electrolyte. Use only distilled water – not tap water, when refilling the batteries. Water is the only element used by your battery. You should never have to add acid to your battery. Do not overfill or fill when the batteries are discharged. Over-watering dilutes the acid excessively and electrolyte will be expelled when charging. Equalization is the controlled overcharging of a fully charged battery. This overcharge mixes the electrolyte, evens the charge among varying battery cells and reduces permanent sulfation of the battery plates. It is energy invested in lengthening the life of the battery. We believe that as a rule of thumb, equalization should be done every 60 to 90 days. Equalization will take your batteries to 15 volts or higher (30 volts on a 24-volt system), so make sure any DC loads are disconnected before you begin. The equalization process consumes water and produces gassing. Make sure your batteries are well ventilated during this charging. The batteries should be monitored closely during this process. Check specific gravity of all the cells at the start, noting any low cells. Keep checking electrolyte density during the process, until you receive three readings of 30 minutes apart that indicate no further increase of specific gravity values. The fumes produced during Equalization can be very destructive to fabric and upholstery if the batteries are located in the living area of a boat. The area needs to be well ventilated. Battery conditioners (desulfator) are an alternative to equalization. Battery conditioners use a sweeping pulse of energy emitted into a battery bank that eliminates and prevents this life limiting process. The frequencies at which these pulses are emitted are tuned to excite the structural components of the sulfate deposits. This process enables sulfation to revert back in to the electrolyte. Battery Protectors can save replacing your house battery bank and provide the best insurance policy for small price. Battery protectors sit between the battery bank and your house loads. If for some reason you should draw down your battery below the preset level (typically 10.5 V), the battery protector will disconnect the loads saving the battery bank. Typically refrigeration is left on board when you leave the boat draining your batteries down causing you to lose your battery bank and ultimately be food in the refrigerator. The battery protector would disconnect the refrigerator saving the house battery bank, but yes you will still have bad food in refrigerator.